Simhachalam, the Hill of the Lion (Simha means “lion”, and chalam means “hill”), is located 18 km from Vishakapatnam in Andhra Pradesh. Here we find a most beautiful 11th century temple in which resides the presiding Deity, Sri Varaha Laksmi-narasimha. Millions of devotees each year come to visit Lord Varaha Lakshmi-narasimha, Whose form combines the iconographic features of Varaha and Narasimha. The Deity resembles a Shivalingam covered with sandalpaste. Sandal paste was offered to Lord Nrsimhadev to appease His fury after the slaying of Hiranyakasipu. Once a year only, during the Chandana Visarjana, the Visaka day in May, (Akshaya Tritiya day), the sandal paste is removed from the Deity so the devotees will get to see the real Form of the Lord. The Deity is sculpted in tribhanga posture, having two hands with the head of a lion on a human torso. 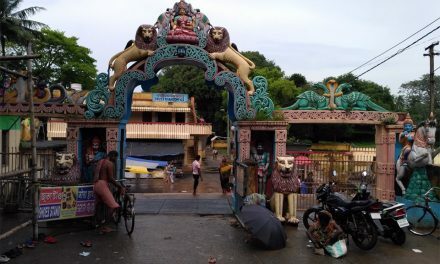 The Nijaroopa Darshan, or appearance in true form, continues for 12 hours and lakhs of people from various parts of the State gather at the temple to worship the Deity. Peeling off the old sandal paste from the Deity and applying new paste takes about 18 hours. Devotees get to see the true form of the deity during the inter regnum. Sandalwood is specially brought from Vellipoottur in Tamil Nadu to be used in preparing the paste which is applied three times a year, on Vaisakha Pournami, Jyestha Pournami and Ashadha Pournami. About 120 kg of sandal paste is applied each time. On Sravana Pournami, the Lord is covered in the sandal and decorated with opulent ornaments, known as Karala Chandana Samarpana. Today, Simhachalam temple is known as the second richest temple, after Tirupati, for donations from pilgrims. The Sthala Purana for the temple describes the temple in 32 chapters, and Vedavyasa wrote about the original temple in the Skanda Purana. According to Puranic records, Hiranyakasipu tried to punish his son Prahlada by throwing him into the sea. He then placed Simhachalam hill over his head in order to drown him. Lord Narasimha rescued Prahlada, tilted the hill by standing it on one side so that Prahlada could escape. Later Prahlada founded this shrine. The Sthala Purana consists of a further account of the foundation of the temple. The temple was at one time a favorite resort of the demigods, but fell into disuse. Urvashi, the divine apsara, informed Pururavas that she had come to the Simhadri hill when Lord Narayana came as Narasimha in order to save Prahlada. Urvashi with Pururavas found the Gangadhara rivulet flowing west. Pururavas wished to have darshan of the Lord through penance. On the third day of meditation he saw the Lord in his dream, telling Pururavas that an ant-hill in front of the king held the Deity, and the king should offer flowers, sandal wood, music, lamps, and incense to the Lord. The king woke up, searched the anthill, found the Deity, renovated the temple and consecrated it. However, he did not find the Lord’s feet. The Lord informed the king that the feet will not be visible, and are hidden in the earth,. Sight of them will get one salvation, so they should not be seen in pure form, but only covered with sandal paste. The exception is for one day on Akshaya Tritiya, when the mere sight of the Lord’s feet is enough to bestow salvation. The Vyasa pournami, the Ashadha pournami days, and the Kalyanotsava in the first week of April are also important festival days here. The inscriptions on the walls and pillars provide a great deal of information on the temple’s history. There is an inscription dated 1099 AD belonging to King Kulottungachola, who conquered Kalinga. Another belongs to the Velnati Chief, Gonka III and is dated 1137 AD, and states that he covered the image of the Lord with gold. There are a number of inscriptions from the Eastern Ganga kings of Kalinga. King Narasimha I constructed the central shrine, the Mukhamantapa, the Natyamantapa, etc. The Reddy king of Rajahmundry, the Vishnu-Vardhana Chakravarthins of Panchadarla and others also contributed to enriching the temple. Sri Krishna Devaraya visited this temple twice in 1516 and 1519 AD, and the jewelry offered by him to the Lord, including an emerald necklace, can still be seen here.